Hey Everyone! How was your weekend? Ours was excellent! We spent the weekend in a cabin in the mountains and I didn't want to leave. There is just something so peaceful and magnificent about living a simpler life. Rosalie loved being outside, and both of the grand babies in my family (Rosalie and my sister's little boy Jax), were spoiled rotten. We also ate some yummy food because calories don't count when you are camping. ;) I will have pictures from the camping trip up sometime this week. :) Today I wanted to show you guys this super cute midi-skirt. I really liked how comfortably it fit, and how flattering it was. It is also super affordable, so be sure to check it out! I hope you all have a wonderful Monday and Labor Day if you are in the United States. I'm wearing black and white stripes today, too! Great minds :) Love this skirt! And the silhouette is lovely! This skirt is perfect! I want it! I love the pattern, style and shape! Very cool skirt! 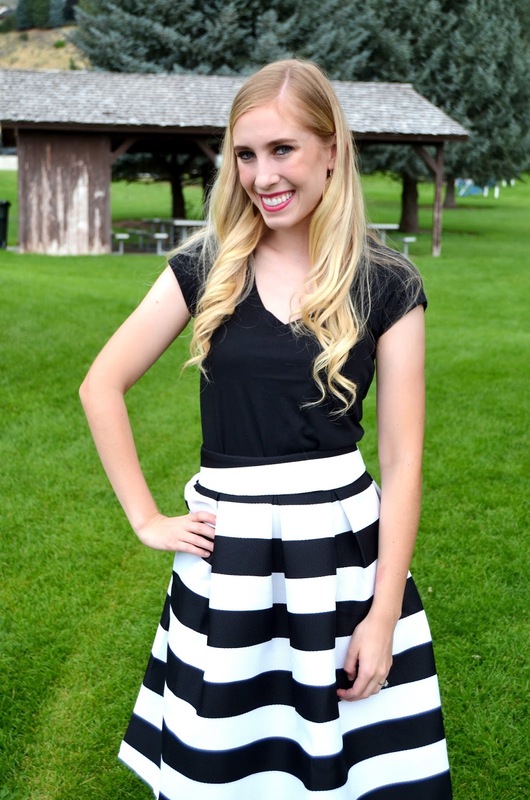 I have about a million striped skirts, but I want to add this one to my collection! What an awesome skirt! I love the strips and the midi length. Great teal shoes too! 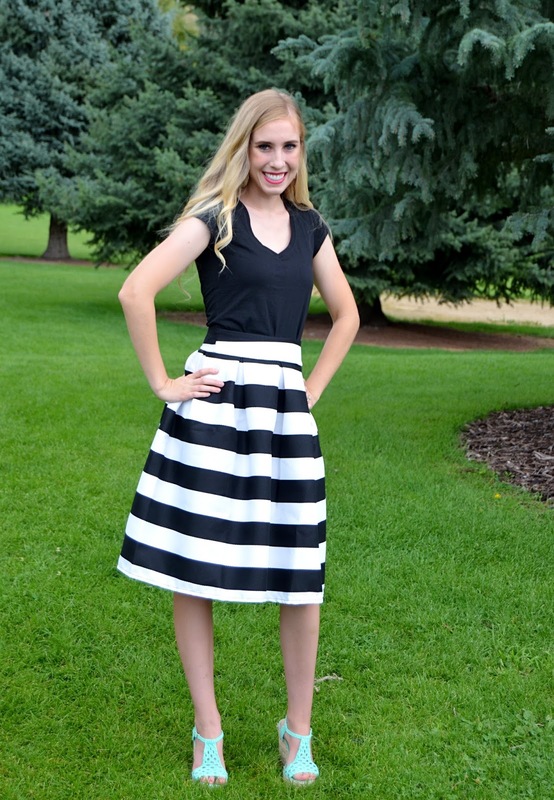 Love that striped skirt, perfect fit and length, beautiful color of the shoes. Gorgeous skirt!!! If you still haven't - you got less than 24 hours to join this huge GIVEAWAY I am hosting for THE KEWL SHOP where a $150 dress value is at stake!